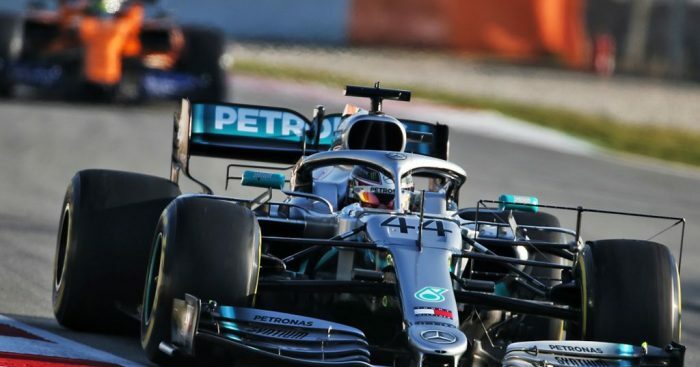 Lewis Hamilton reckons Formula 1’s midfield has closed the gap to the top three teams, saying they are “within half a second or maybe less”. Winter testing concluded last Friday with a P1 for Ferrari’s Sebastian Vettel. The German clocked a 1:16.221 to edge Hamilton by 0.003s. But while Ferrari and Mercedes took the top four spots on the overall timesheet, Renault in fifth were half a second off the pace and just ahead of Toro Rosso and McLaren. Asked for his thoughts about the pecking order as the drivers prepare to head to Melbourne, Hamilton said: “I think it is the three teams, but also the teams at the back have closed up as far as I’m aware. “The whole pack has closed up. “I don’t know which team is fourth currently, but they are a lot closer than they were before. “There was like a second gap before, but now they are within half a second or maybe less, which is awesome. “So depending on how their development is during the year and whether they have the capacity to develop as quickly as the top three teams will be the question, but it will be exciting. The reigning World Champion reckons this season could come down to the development war and who brings the best updates as the season progresses. “Our teams – us, Ferrari and Red Bull – are all quite strong in that area, in terms of development,” he told F1i.com. “Red Bull in the past have had quite strong development during the years, been right up there with the best, but I think it’s all very, very close with us. “It is a development race, but I think I’ve got as strong a team as I could possibly have to fight that development battle. “Naturally when you start one foot ahead it’s easier to stay, or if you’re two or three steps ahead, it’s easier to keep at least one of those feet ahead throughout the year.